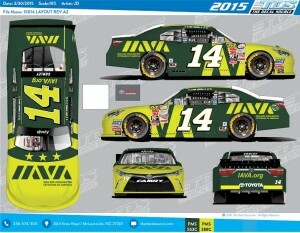 NEW YORK (April 8, 2015) – TriStar Motorsports and Iraq and Afghanistan Veterans of America (IAVA) are proud to reveal a new paint scheme on the No. 14 Toyota Camry beginning this weekend at Texas Motor Speedway. Founded in 2004 by an Iraq veteran, IAVA’s mission is to connect, unite and empower post-9/11 veterans. IAVA has become the leading post-9/11 veteran empowerment organization (VEO) with the most diverse and rapidly growing membership in America. Celebrating its 10th year anniversary, IAVA has repeatedly received the highest rating – four-stars – from Charity Navigator, America’s largest charity evaluator. 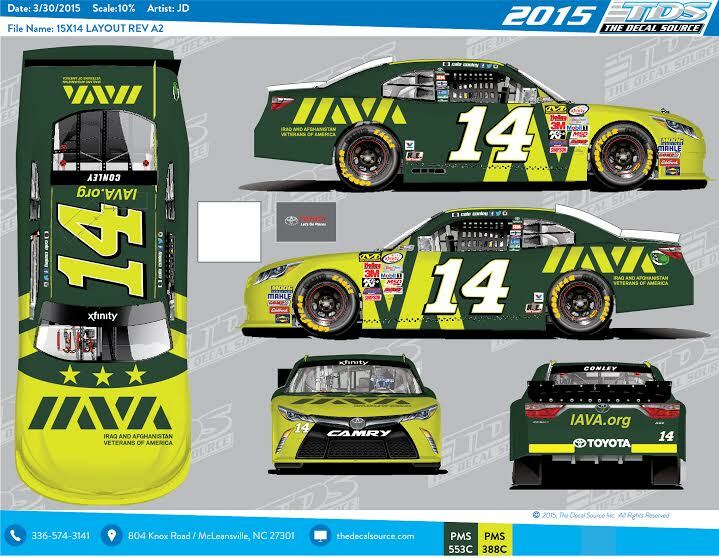 Conley expanded his relationship with IAVA beginning at Las Vegas Motor Speedway and is taking it to the next level with the paint scheme upgrade. Conley’s Camry will run the green and yellow of IAVA indefinitely this season. As an avid supporter of current and former military, Conley is especially excited to represent them on Memorial Day and the Fourth of July, participating in veteran events and hosting veterans at the track. Be sure to tune into the O’Reilly Auto Parts 300 on Fox Sports 1, PRN and SIRIUS XM Channel 90 on Friday, April 10 at 6:30PM ET. TriStar Motorsports NC, LLC currently fields Toyota Camry’s in the NASCAR XFINITY Series for Mike Bliss, Cale Conley, Blake Koch and David Starr. Located in Mooresville, North Carolina, TriStar Motorsports has competed in the NASCAR Nationwide Series since 2010; fielding cars for some of NASCAR’s top drivers. To find out more information about TriStar Motorsports please visit www.tristarmotorsportsnc.com, like us on Facebook and follow us on Twitter.